The sun shines on the entrance to Clint Ritchie Gymnasium at Sumner Memorial High School in Sullivan in this January 2019 file photo. A Hancock County High School was closed for the day on Monday due to an outbreak of illness. 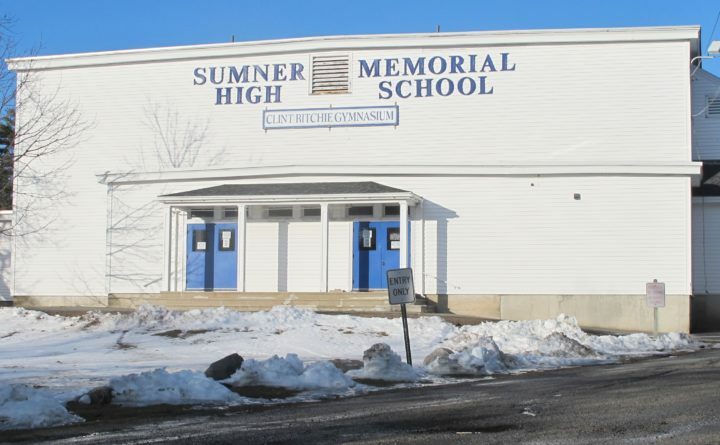 Sumner Memorial High School in Sullivan was closed due to the “extremely high number of staff at SMHS who are experiencing illness” as well as “the low number of available substitutes,” according to a statement on the Regional School Unit 24 website. The four grade schools of RSU 24, which serves Eastbrook, Franklin, Gouldsboro, Mariaville, Sorrento, Steuben, Sullivan, Waltham and Winter Harbor, had regular sessions, according to the notice. It was not clear what illness or illnesses had forced the closure of the high school for the day. Superintendent Michael Eastman did not immediately return a message left Monday. Illnesses hit hard enough in January to prompt a notice to parents informing them of the presence of whooping cough and other respiratory illnesses in the eastern Hancock County district and neighboring school systems.